Unsecured creditors of failed textile manufacturer Hawick Knitwear have been told they may receive a “small dividend” when the company’s affairs are finally wound up. The Liddesdale Road firm went to the wall over 18 months ago with the loss of 179 jobs with around 120 of these creditors owed a total of £1.3m when administrators KPMG were appointed in January last year. These included major yarn suppliers Hinchliffe and Sons (owed £435,000), Todd and Duncan (£228,000) and Filivivi SRL (£67,000), along with HM Revenue andCustoms (£273,000). Around 70 smaller unsecured creditors were owed sums of £1,000 or less. 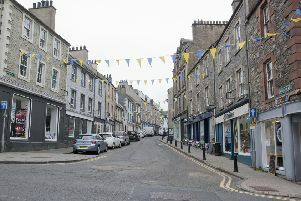 A progress report issued last week by KPMG reveals that sole secured creditor, HSBC, which was owed £686,000, has now recovered this in full from former Hawick Knitwear customers who owed the company around £840,000 when it entered administration. “Residual debtor balances have a total book value of approximately £165,000 spanning around 90 accounts,” states KPMG. There is better news in the report for preferential creditors – the former employees of Hawick Knitwear – who are still owed around £65,000 in arrears of wages, accrued holiday pay and certain pension benefits. “Our reconciliation and adjudication of preferential creditors’ claims are being finalised,” states the report. “We anticipate they will receive a dividend of 100p in the £. KPMG says it hopes to bring its administration to an end by January 6, 2018. “However, if this is not possible, we will request the Court grants a 12-month extension to the administration in order that all outstanding matters are finalised”.